Please stop by the “Welcome Desk” downstairs, or the back of the sanctuary, to pick up a Prayer List, Calendar, or Thuse News. DVD's of our service may be requested on the form from the pew pocket. Prayer request slips are also in the pew pockets. Pastor Jim and the Church Secretary will be in their offices Monday, Tuesday, and Thursday 12:00 noon-4:00 and Wednesdays 1:00-5:00. 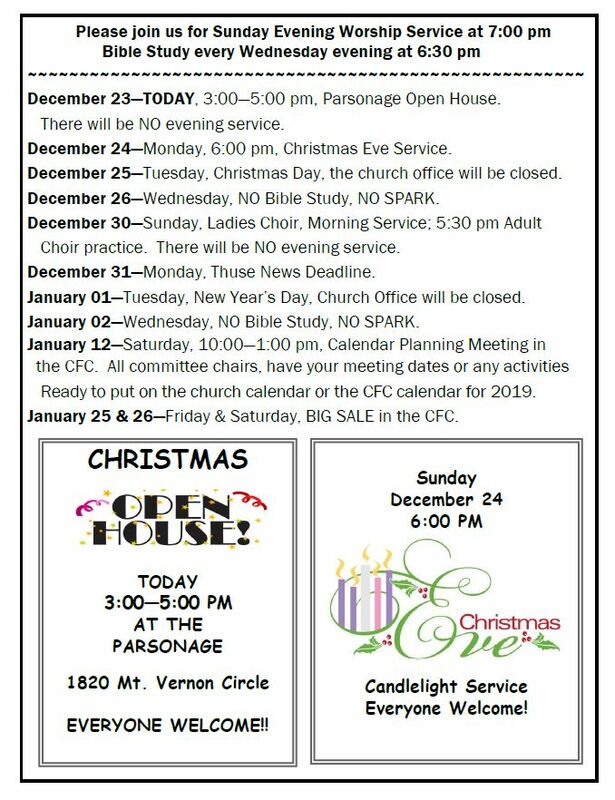 If you have anything that you would like to put in the bulletin, on the calendar or the prayer list, please call the church or e-mail it to the church at spumc1813@gmail.com. Thank You. HELP...Please write announcements, prayer requests or blessings and give them to the liturgist PRIOR to the beginning of worship services so we can get the names correct and they can be read into the microphone for all to hear. Thank You! You are invited to WALK IN THE CFC on Mondays, Wednesdays, and Fridays between 7:30 - 9:30 a.m. Blood pressure taken on Mondays.